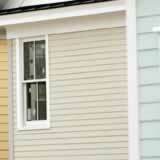 You plan to install new vinyl siding on your home to freshen it up, but what about your soffits? When most people look at the exterior of their homes, they see siding, shingles, windows, and doors, but those inconspicuous soffits can play an important role in the energy-efficiency of your home. They can also determine if you'll have roof leaks during the winter months. A sizable percentage of older homes have inadequate attic ventilation because builders didn't realize how important it was to a home's health. Without proper air circulation, heat can build up in an attic causing your summer cooling costs to escalate. Poor air circulation may also allow condensation to collect on the underside of your roof sheathing. Over time, this can lead to extensive damage. Your home may even be more prone to water leaks from ice damming without enough attic ventilation. One of the best and least expensive ways to allow fresh air into your attic is through soffit venting. Vented soffit material doesn't add much to your siding cost (you can purchase the materials for about $1.50 a foot for overhangs of 12 inches). But, prices may vary depending on color and where you live. Most siding manufacturers offer soffit materials in both vented and un-vented styles, so you can match porch ceiling to your vented areas. You might want use professional contractors to install any ridge vents or attic fans, but you can add gable vents during your DIY siding project. You'll find that many siding distributors stock them.